Now, with the new high port-density Desktop Gigabit Switches from D-Link, upgrading your desktops to Gigabit connections has never been more cost-effective and easier. These desktop Gigabit switches offer an economical way for your workgroup to benefit from the increased bandwidth of Gigabit Ethernet. Each equipped with 16 Gigabit ports, these compact desktop switches provide for fast access to servers to meet your users' increasing network load. With plug-and-play installation and copper Gigabit ports capable of connecting to your existing Cat. 5 twisted-pair cable, these devices instantly enhance your workgroup's performance without requiring you to install expensive fiber cables or to go through complex re-configuration. All ports support 10/100/1000Mbps network speed auto-sensing and full/half duplex auto-negotiation. The Gigabit ports provide dedicated bandwidths for your desktops running at 2000Mbps full-duplex. This gives workstations bottleneck-free paths to simultaneously access server data. This function support allows your servers to directly connect to the switch for fast, reliable data transfer. At 2000Mbps full duplex, the switch provides high-speed data pipes to your servers with minimum data transfer loss. All ports support auto-negotiation of MDI/MDIX cross over. This eliminates the need for cross over cables or uplink ports. Any port can simply plug to a server, a hub or a switch, using the usual straight-through twisted-pair cable. 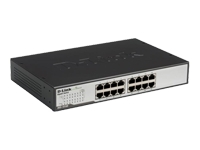 These switches integrate seamlessly with your existing network equipment, be it Ethernet, Fast Ethernet or Gigabit Ethernet, dispensing you of the need to replace any hardware or software. With 10/100/1000Mbps auto-sensing, auto-negotiation for every port, plus the ability to exist with your Cat. 5 wall wiring, network installation is a breeze. All you need to do is plug the cables to the switch, and your network is up and running in a matter of minutes.